The VideoSphere Video Management System (VMS) is high-performance server software that runs on industry-standard host and storage platforms. It enables organizations to deploy all IP or hybrid IP/analogue video networks that are open, distributed, fully scalable and return significant infrastructure and administrative cost savings. 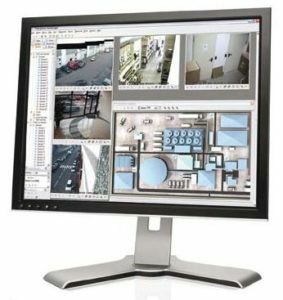 A cornerstone of the VideoSphere portfolio, VMS is ideal for medium to large scale surveillance applications. It allows organisations to stream high-quality, high frame rate video from up to 256 IP or analogue cameras per server directly onto an IP LAN or WAN, archive that data on fault tolerant storage arrays, in either centralised or NAS configurations. Multiple host and storage servers can be clustered to support installations numbering thousands of cameras. VMS supports both H.264 and MPEG4 video compression to ensure the highly efficient use of network bandwidth and storage capacity. This helps eliminate the need to operate separate video networks and reduces total cost of ownership through the convergence of both infrastructure and administrative resources. 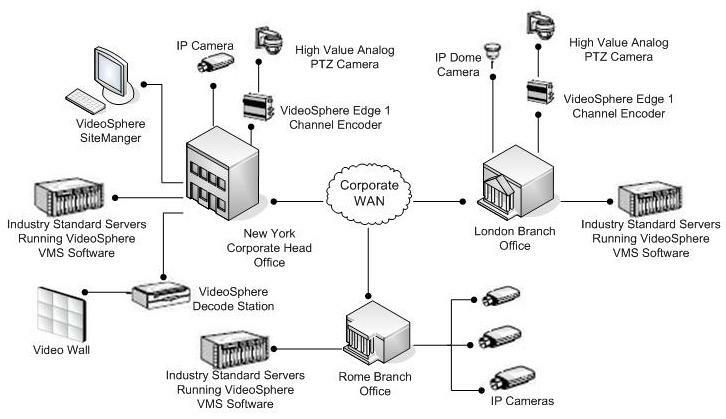 Multiple fixed and PTZ IP cameras are supported by VMS, including VideoSphere high definition IP cameras. VideoSphere Edge encoders also allow existing or new analog cameras to continue to play a key role in hybrid video infrastructure, preserving current camera investments. In addition, the Edge encodes advanced multi-sector recording functionality allows video from any analogue camera to be recorded simultaneously at different frame rates and resolutions for live and longer recording purposes. An innovative family of March Networks video analytics² adds system intelligence to the process of detecting, classifying and tracking suspicious activity captured in the surveillance video. From camera tampering or perimeter breaches to long lineups, staff can be automatically alerted to significant incidents and can respond more immediately and effectively. Alarms triggered by switch contacts, events such as motion detection, and data from sources such as ATM or POS transactions, are also supported by the VMS. VideoSphere SiteManager is the desktop application software used to configure and exploit the power of VMS from anywhere on the corporate network. It allows administrators to quickly commission each server following software installation and includes an auto-detect feature that recognizes, enables and assigns IP addresses and video storage space to all networked VideoSphere cameras and encoders. An innovative shadow archiving feature ensures convenient remote access to video recorded by VideoSphere MegaPX cameras with integrated SD cards. Following a network outage, for example, video recorded on the memory cards is automatically identified by the VMS and can be accessed easily via SiteManager. Enhanced user access controls are available through SiteManager’s optional Enterprise Service Manager (ESM) application. The ESM allows administrators to group devices by function, geography or customer hierarchy for efficient user permission creation and management. The access controls can be easily integrated with existing IT user authentication systems (e.g. Windows Active Directory) if desired. Administrators can also use the ESM to monitor and maintain the health of entire VMS infrastructure including servers, cameras and encoders. Alternatively, they can outsource their system health management to March Networks 24/7 NOC for highly skilled, proactive support.